Pic 1: - Packaging is vastly larger and far thicker than G1 Starscream's. Being a Masterpiece figure, the matte black box with gloss photo remains consistent. Pic 2: - The oversized clear plastic bubble holds Starscream and his accessories in place. Speaking of accessories, you get the plastic cape, crown, shoulder pads and a holo-pilot. The stand, missiles and gun peg are nowhere to be found. 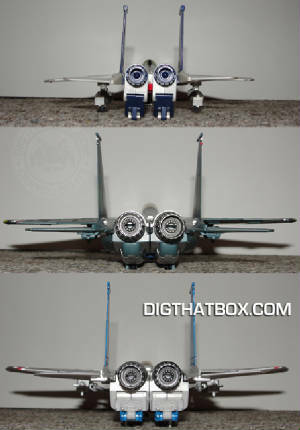 Pic 3-4: - MP-11 Starscream's paint scheme is obviously inspired by his G1 counterpart. Unfortunately, he is also light on detail paint, making his jet mode look more like a toy than MP-03's. Don't worry, all the molded detail is still there. Still, a light wash of weathering would help to bring it out. Although not featured in this review, virtually all the MP-03 gimmicks are still part of MP-11 including the retractable landing gear, visible nosecone gyro, opening canopy, air brake, tilting flight surfaces, opening engines and tilting jet thrusters. The only things missing are the interchangeable missiles. 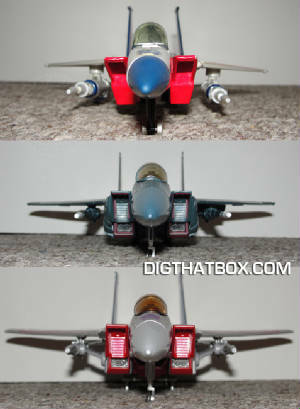 Pic 5: - In profile, the differences between the MP-03 "Air Commander" Starscream and MP-11 "New Leader" Starscream become obvious. MP-11 is far more angular than MP-03, with every detail from the air intakes back being different. MP-03 looks like a model kit, whereas MP-11 is obviously a toy. Pic 6: - The undersides tell the same story. MP3 does an incredible job concealing robot parts through the use of smooth parts transitions and matching colors. MP-11 is betrayed by contrasting colors and harsh transitions. It's worth noting that brackets now hold the Null Rays to the figure, so that the Rays aren't detached during transformation. This is probably why missiles no longer come with this set. Pics 7-8: - Front and rear views are virtually identical. The only big mold changes are the Null Ray brackets and the boxier tail end. Pic 9: - Transformation of MP-11 is virtually identical to MP-03, with the exception of 1) the hip kibble is now part of the legs 2) the feet have heels made from the jet engine mechanicals and 3) the Null Rays fold over their brackets to connect with the upper arms. In robot mode, it becomes obvious that the head was also remolded. The 2-face gimmick has been replaced by wider, more cartoon accurate, side vents. NOTE: The joints are still fragile and fiddly, although not as bad as MP-03. You'll want to pay special attention to the hinges that fold the wings onto his back. Transform him a few times and I bet you'll see stress marks develop. Pics 10-12: - In profile, you can see that the new heels certainly help MP-11 stand without resorting to awkward poses for stability. The longer wings on MP-11 (similar to G1) remove kibble previously attached to the intakes flanking MP-03's head. Pic 13: - The original prototype shows us the rocky road Masterpiece Starscream has had to endure. MP-03 focused less on the robot mode's cartoon accuracy in an attempt to make a very convincing jet mode. MP-11 restores the original intended design, adding needed improvements such as heels and a better head. Pic 14: - Taking a step back, it becomes obvious that the changes to MP-03 resulted in an unstable, top-heavy, kibbly, but still impressive robot mode. 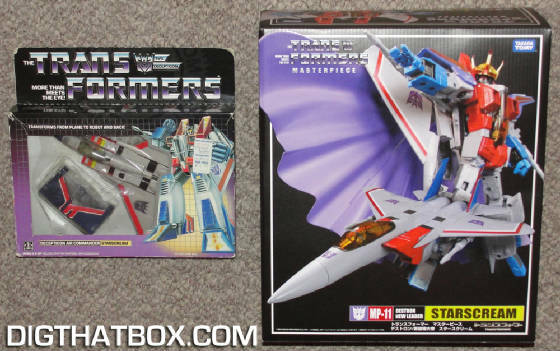 Pic 15: - Compared to the US Masterpiece Starscream, MP-11's robot mode shows a disturbing lack of paint apps. Considering that MP-11 costs more than double that of the US release when new, one would think they could have done more. Pic 16: - Even so, let's not forget all the wonderful accessories. MP-11 can't wait to display his arrogance with his ceremonial garb. The cape is articulated plastic, so it can expand and tilt as if billowing in the wind. Shoulder pads attach to hinges, so they can move up and down. The crown is beautiful in gold chrome, although it's tough to put on without tilting back the red intake manifolds on Starscream's shoulders. It's worth noting that the chest missile banks are still here, along with all that Masterpiece poseability. Poor G1 Starscream can only raise his arms. 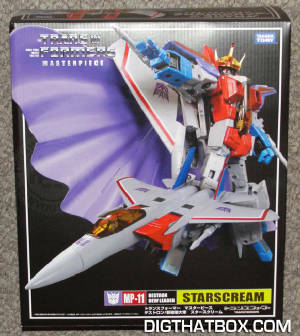 Pic 17: - Starscream has now come to us four times as a Masterpiece figure (seven of you count Takara Skywarp, Takara Thundercracker and US Skywarp). But don't think this is Masterpiece Starscream's last hurrah. 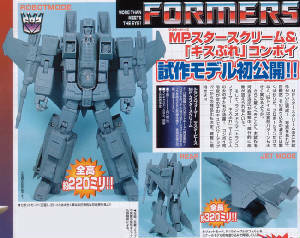 MP-11 Starscream will return this August as MP-11S Takara Sunstorm...seriously. I'm torn. I was disappointed by MP-03's fragility and robot mode inaccuracy, but LOVED his jet mode's realism. Sure, MP-03 is the wrong color. But the color makes him more threatening in both modes. 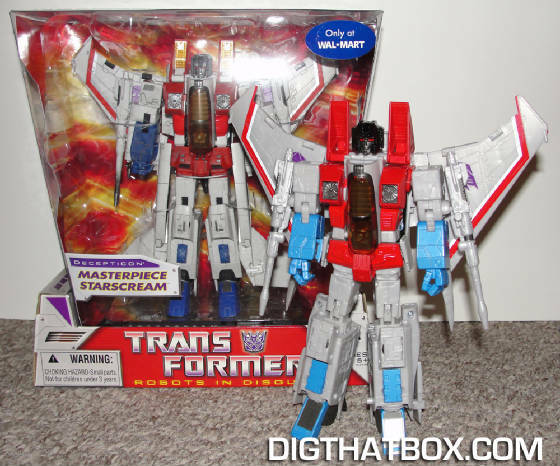 Michael Bay should have used THIS as his Starscream...colors and all. Now that MP-11 has given us the prototype mold (with head and heel improvements) I LOVE the robot mode but don't like the jet mode's clunky aesthetic. The colors scream, "This is a toy" but are a perfect homage to G1 in both modes. The accessories are a wash. The ceremony set is great and he no longer needs his stand for stability. Still, the stand did allow MP-03 to have dramatic airborne poses in both modes, showing off the quality of the sculpt. You know what? If you have the money, split the difference. Buy MP-03 for jet mode; buy MP-11 for robot mode. If you want something to play with but worry about breaking the wings off, buy the US Masterpiece Skywarp off of E-Bay for thirty-five bucks.